Wagon Wheels, Wooden Wagon Wheels, Cannon Wheels, Steel Wagon Wheels, Yesterdays Products,Today. 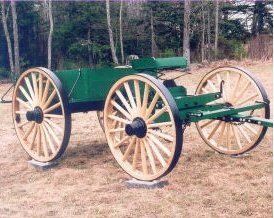 When you have been building Wagons and Wagon Wheels for over Fifty Years, your customers have something to say, and say they do. Below you will find comments from around the world about the products we sell and how some of your customers put our products to use. 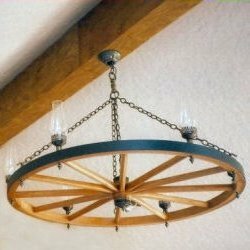 We receive hundreds of letters and e-mails from the Wood Wagon Wheels, Cannon Wheels Wagon Wheel Chandeliers, Horse Drawn Wagons, Smoker Steel Wagon Wheels. BBQ Steel Wagon Wheels. Carriage Wheels and Buggy Wheels we make. Jay I received the wheels and axle I ordered recently and they are beautiful. 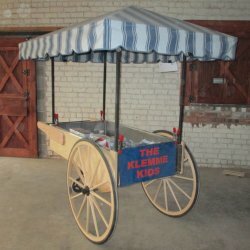 As I told you, I am building a peddlers cart for my great grandchildren. I have the box and handles made and installed. I am waiting for four small brackets that hold the awning roof and it will be complete except for the staining or painting. I used some of the prettiest oak for the box and handles. The piece I used was about 13" wide and 16' long and there was not one blemish in the entire piece. Did you make the wheels in your shop? 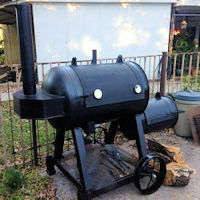 I am a wood guy and I wish I lived closer to you, I would like to see all of your equipment for making such beautiful wheels. Thank you for all of your help and I really appreciate your friendly service. How are you? Thanks for all your help. We made the wagons with your wheels. 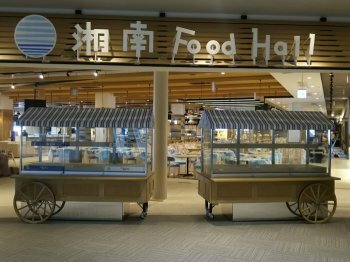 They are used in shopping here in Japan for a mall`s food court. Please see attached some photos. Again, I appreciate all your help, the project would never have been built on time without your help. 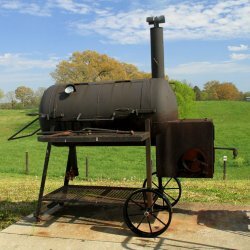 To all the people who have sent us pictures of their smokers and BBQ projects, I am sorry that we just do not have the room for all the emails. We are going to put up some of the many pictures that we receive each month. 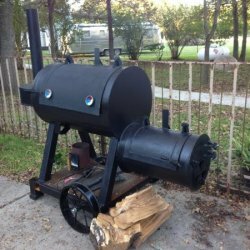 We will be building a page just for smokers and BBQ’s in the next few weeks, so you will see your emails and your projects on the web. Thanks for your trust in our products; we know how you people feel about the food you turn out on these cooking instruments. 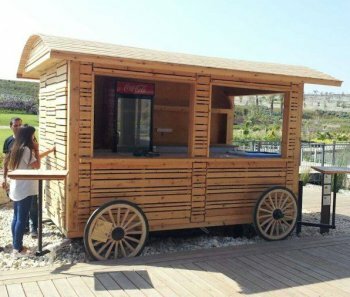 Enclosed are pictures of your wheels on the new Ice Royal Frozen Yogurt concession stand. None of it would have been possible without the excellent help of you and your team to get the wheels made and help with the problems of shipping to Israel. Thank you again for the help and working with us to make this happen. 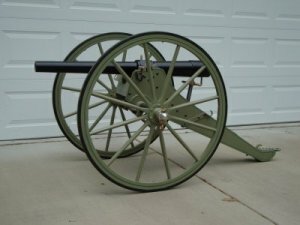 I completed the cannon project. The wheels look perfect. 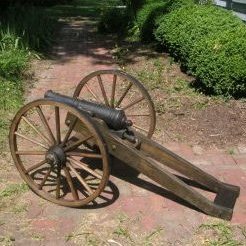 It is a Hotchkiss mountain gun in muzzle loading form. (to avoid problems) I made the castings for the carriage. 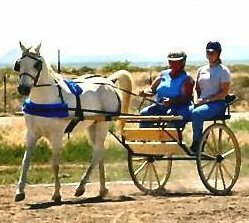 The carriage is made of 1/8 inch plate with an angle iron frame. Thanks for your help with the construction. 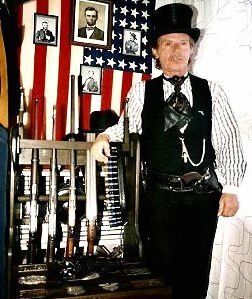 This is my buckboard that I used for Cowboy Action Shooting. 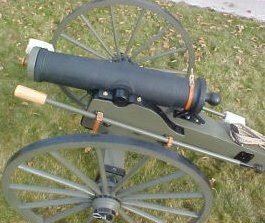 It has a detachable gun rack to hold a rifle and shotgun which is not shown. The wooden bucket is used with a pair of long tongs to pick up empty brass and shotgun shells. I have a scoop designed for cat litter to sift the sand out of it and all brass is deposited in the spittoon for reloading. The box was made for the military for some reason and was olive drab with "U.S". stenciled on it. I painted it black and mounted cabinet handles on each side. It contains ammunition and accessories such as the tongs, ear protectors, thermos, cup, canteen. I also have a small ice chest with cold water. I have also put an iPOD player in a sack playing cowboy music. The wagon has been stored in my shed with junk piled on top of it, so I decided to make a better use for it and it will be parked under a tree in the shade where the sprinklers won't hit it and the buckets will make good cactus planters. It will also be a nice photo prop for grandchildren pictures. I GOT MY CHANDELIER!!!!! Its absolutely beautiful, you do amazing work! I can't wait to hang it above our table and send you a picture!!!! Over the years I have learned that Wagons, Wagon Wheels and Cowboys knows no boundaries or borders, it is evident in this letter from Switzerland. Please excuse my English, this is a translation program, I hope for you it works and you understand. I have enclosed picture from me with your wheels on cowboy gun cart, you very helpful in helping me to get what I need for gun cart. 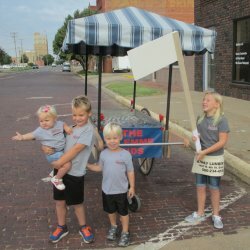 Had lots of fun at the parade, it was a blast! Wheels stayed on, rolled along just peachy, horse behaved (even when the camel walked by him in the staging area).... a nice sunny day in California... what more could I ask for? It really was fun. My dashboard on the cart did fall off that morning, the leather keeper straps have dry rot, but that is an easy fix... So it is all good. Thanks so much for all the help and advice, it really means a lot to me. Sorry it took so much of your time and so many calls, though! Wheels arrived this week and they are beautiful. 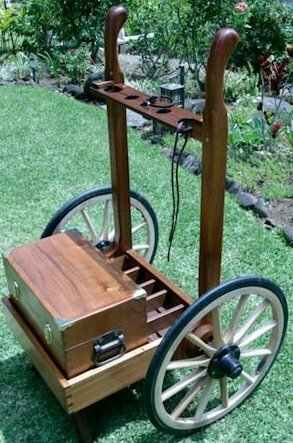 I have attached a photo of my gun cart that I use for cowboy action shooting. These wheels are unreal, they make pulling the cart so easy. You were a lot of help talking me through the process and helping with the wheels that I needed to make this gun cart work. Please find enclosed a photo of the dump cart we rebuilt this winter with the help of the wheels you provided. It was greatly appreciated that you were able to use the original hubs as most of the carts other hardware was also reused. Please feel free to give out my contact information to anyone looking for references, everyone here was very pleased with the quality of your work. NOTE: The front wheels on this project are 48" in dia. and the rear wheels are 54" in aid. The wheels have eighteen spokes and are 4.0" wide. 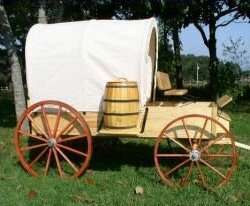 Finished my 5/8's scale decorative Chuck Wagon, it is 6 feet long and 30 inches wide. Your wheels helped me make the project. I told you I'd send your some pictures, you will find them enclosed. Thanks for your help and putting up with me on this project! Just installed the table last weekend!!! I thought you may want to see your wheels. 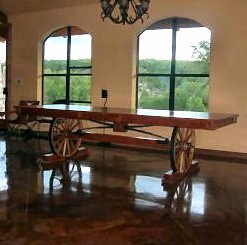 The table is 10' long and 44" wide and made of Texas mesquite. The new owner loves the table. Wheels have arrived in a bit less than 24 hrs transit time... They are exactly what I hoped for. Very well made and in perfect scale for my purpose.. Frankly, considering what goes into making such a complex structure I don't see how you can sell them for such a reasonable price. I went straight into the shop and turned the axle so I could make a trial assembly before bed time.. like a kid with a new toy! I will send a picture when things are further along. Again, thanks for all your help. If any customer wants to e-mail me inquiring about your quality and workmanship you are more than welcome to give out my e-mail address. Thanks again for the great wheels, they really add a authentic look to what has been a very fun winter project. I bought a chandelier from you a couple yrs. ago and it's been great!!!! I would like to duplicate it, except make it 32". Everyone comments on it, and i was impressed with the workmanship on it. 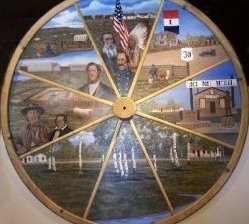 Your help and support was appreciated in getting to the museum the 12 foot wagon wheel used for our new exhibit. The new exhibit was dedicated on July 4, 2006. Thank you again for all your help and the professional manner in which you worked with us. Thanks so much. I am so proud of my new wheels! 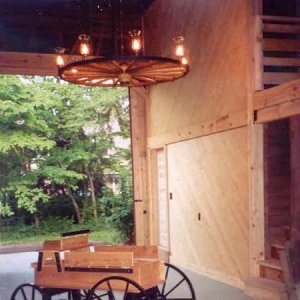 Your Wagon Wheel Chandeliers and the Farm Wagon make my barn the best looking barn in North Carolina. The patience that you and your people had in working with me to help me get the right items for the look that I wanted went well beyond the norm.Â There was always time for someone to speak with me and help make the right decision. It was a pleasure to meet you and your wife and family, especially Bo the Black Lab shop dog. Again, thank you so much for all you did to assist me and my barn project, I really love my barn now. This is so beautiful! It could not have been a more perfect match to my decor! 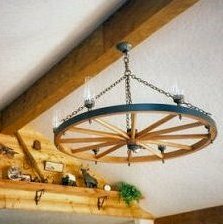 Thank you so much for such quality and the way you and your people worked with us to get the right wagon wheel chandelier, as I said, it is the perfect match! If someone told you that in the 21st century there would be a need for Wagon Wheels, Cannon Wheels, Steel Wagon Wheels, Wagon Wheel Chandeliers, Wood Buckets, Wood Butter Churns and Horse Drawn Wagons, you would think they were out of their mind. Well, our business is growing and there appears to be no end to the need for the products that we produce and now with the Internet, we sell around the world. 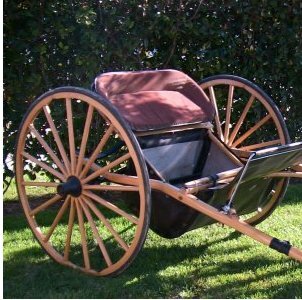 No other country in the world built and used the horse drawn wagon and wagon wheels like the Americans have over the past 250 years. Wood Butter Churns - Wood Buckets, Take A Trip Back In Time.... Both adds a country accent to your home. Like all of our churns or buckets, it is a replica of old style used on the American frontier and in farm houses throughout the US. Sanded smooth white pine and hoops that are fastened by copper nails. Add a great country or antique accent, or unfinished, it makes a project for painting or stenciling to add your own personal touch. Wood Wheelbarrow, Handcrafted and Works in your garden or yard, quality workmanship to insure years of service. 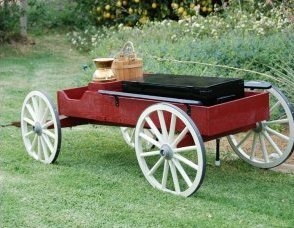 This wheelbarrow is constructed of solid wood with steam bent wooden wheel and steel rim. The sides are removable for oversized loads or for more decorating options. Great for seasonal yard or porch decoration, fill with pumpkins and corn in the fall, fill with plants in the spring and summer, or use for general landscaping.